According to reflexologists, the health and condition of the body can be read from the hands and feet. By massaging certain reflex points on these extremities, therapists believe that it is possible to improve the health of every organ and body system and, therefore, to encourage the body to work more efficiently. Like the Eastern therapies of acupressure, acupuncture and shiatsu, reflexology works on the theory that health depends on the flow of energy within the body. In the eastern therapies, energy flows through channels, or meridians. In reflexology, 10 channels, known as zones, are thought to terminate in the feet and hands. In 1917, Dr. William Fitzgerald developed the concept that parts of the body are intimately linked together in zones and that it is possible to anesthetize one part of the body simply by applying pressure to another. Dr. Fitzgerald’s ideas were further refined in the 1930s by another American, physiotherapist Eunice Ingham, who decided that the various zones could best be accessed through the feet. She then went on to invent the familiar reflexology maps of the feet. Reflexologists have defined 10 energy zones dividing the body into longitudinal sections, beginning at the head and terminating at a finger or toe. They believe that any medical condition that upsets the energy flow through a zone of the body will interfere with the healthy functioning of other parts of the body that are located in the same zone. Two principal guidelines on the foot divide the body horizontally and are used by reflexologists to locate the reflex points accurately, whatever the shape and size of a person’s feet. The first one follows the gentle arch running immediately below the ball of the foot and represents the diaphragm separating the abdominal and thoracic cavities. The second one runs roughly halfway down the foot, from the bottom of the upper bulge on the outside of the foot, extending directly across to the other side; this denotes the waist line. Reflexologists use maps of the feet that’s shown how different zones of the feet are thought to mirror various parts of the body. It is thought that illnesses reveal themselves as tender spots on the reflex areas of the affected organs. By messaging the correct points on the feet, the reflexologist can treat virtually any organ in the body. A reflexologist is not trained to diagnose or treat any specific medical conditions. In fact, qualified reflexologists do not claim to cure medical problems. Instead, they treat the person holistically so that, through improving the general health of the body, it is then in a better condition to heal itself. Among the many benefits claimed by reflexologists, perhaps the most obvious one is that it relieves stress by making you feel more relaxed. Relieving tension in the body helps improve circulation, aids the elimination of wastes, and generally rebalances and re-energizes the body. Because of the effect of gravity, the flow of blood around the feet and back toward the heart tends to be sluggish. Perhaps this is why inorganic waste products that cannot be broken down, such as uric acid and calcium crystals, can accumulate in the feet. An experienced reflexologist will aim to locate and break up these crystals, aiding their elimination from the body. Reflexologists claim to help hormonal problems, such as those related to the menstrual cycle, as well as allergies,hypertension, arthritis, back and neck problems, digestive problems, ear, nose and throat disorders, headaches and skin conditions. However, there is not yet scientific evidence to back this up. Before the reflexologist begins treatment, she will dust your feet with talcum powder or cornflour, which makes the skin of your feet softer and easier to massage. The reflexologist will then do some form of massage routine on your feet to make them more supple and relaxed, which makes them easier to treat. This will also introduce you to the feel of the reflexologist’s hands and allow her to adjust the pressure of touch to suit you. The degree of pressure required varies from person have ticklish feet and require a firmer touch is uncomfortable or even painful. Once the reflexologist has established the degree of pressure suitable for you, she will massage all the reflex areas of both feet, feeling for areas of tenderness. The forefinger and thumb of both hands will be used to treat each foot in turn. A particularly tender area will indicate a part of the body that is tense and congested. Such an area will receive special attention in order to break up any crystals. Apart from the odd tenderness, the treatment should feel pleasurable and relaxing. There are no side effects, but some people report feeling physically drained, tired of emotionally stirred after treatment. The first reflexology session will last about an hour, and subsequent ones should last between 30 and 45 minutes. The length of a course of treatment will depend on the patient, although an average is typically about six to eight weekly treatments. 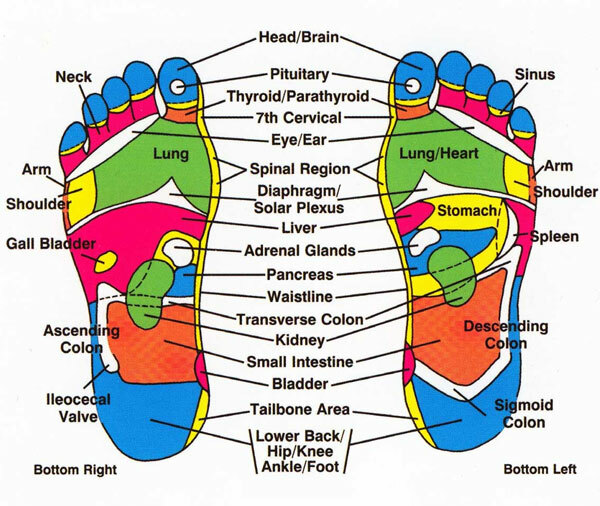 The location of the reflexes for every organ in the body can be seen on the reflexology foot map. Some reflexes, such as the heart on the left foot and the liver on the right, appear on only one foot. This is because there is only one of each organ and they lie on that side of the body. In many instances, there are matching points on both feet. The points on your right foot identify those parts on the right side of your body, while the ones on your left foot correspond to those on the left side of the body. This sequence – and variations of it-is recommended for relaxing the feet before beginning a treatment. Your therapist will start by doing a step on one foot, then move to the other foot, before proceeding to the next step. The last two steps are used to relax the feet after a massage. You can follow these steps if treating a friend. To loosen your feet, the therapist will begin by applying firm pressure with her thumbs down the complete length of the foot. After placing the palms of her hands on either side of your foot, she will gently but rapidly rock the foot by pushing it back and forth, maintaining contact between her hands and your foot. While holding your toes with her supporting hand, the therapist will use her right thumb on your right foot (or left thumb on your left foot) and firmly press into the diaphragm and solar plexus reflex, located at the arch just below the ball of your foot. To apply additional pressure on the diaphragm and solar plexus reflex, the therapist will gently bend your toes toward her, which pulls your foot against her thumb. She will then support the heel of your foot in her hand, with her thumb between your ankle and heel. Using her other hand, she will grasp the top of your foot and gently rotate the whole foot a few times in one direction, then the other. While holding your foot in one hand, the therapist will grasp your big toe with the other hand. She will rotate it for 5 seconds, then gently pull it; then she will proceed to the next toe until they have all been manipulated. While supporting the top of your foot with one hand, the therapist will gently rotate the back of the fingers of her other hand against the ball of your foot six times.